This Memo is for discussion and pre-information purposes only. The information contained herein is subject to change. No part of this Info Memo is legally binding or enforceable, nor is it meant to be, until it has been discussed, reviewed and revised by the board of directors, the board of advisors and Company lawyers. Please do not copy or disseminate any part of this Memo without including this disclaimer. The final version of this White Paper will be published as soon as adopted. Nothing in this Info Memo shall be deemed to constitute a prospectus of any sort or a solicitation for investment, nor does it in any way pertain to an offering or a solicitation of an offer to buy any securities in any jurisdiction. This document is not composed in accordance with, and is not subject to, laws or regulations of any jurisdiction, which are designed to protect investors. The Initial Coin Offering (hereafter, the “ICO”) project presented by NeuroChain (hereafter, the “Company”) was an unregulated fundraising operation. It posed several risks to buyers, in particular, that of losing all amounts traded for tokens issued by the Company (hereafter, the “Clausius” or “NCC”). NCC is a utility token. This has not been registered under the US Securities Act, the securities laws of any state of the United States or the securities laws of any other country, including the securities laws of any jurisdiction in which a potential token holder is a resident. NCC cannot be used for any purposes other than those provided in the White Paper, including but not limited to, any investment, speculative or other financial purposes. NCC is not intended for sale or use in any jurisdiction where sale or use of digital tokens may be prohibited. NCC Token confers no other rights in any form, including but not limited to any ownership, distribution (including but not limited to profit), redemption, liquidation, proprietary (including all forms of intellectual property), or other financial or legal rights, other than those specifically described in the White Paper. Certain statements, estimates and financial information contained in the White Paper constitute forward looking statements or information. Such forward-looking statements or information involve known and unknown risks and uncertainties, which may cause actual events or results to differ materially from the estimates or the results implied or expressed in such forward-looking statements. White Paper can be modified to provide more detailed information. This English language is the primary official source of information about the NCC Token. The information contained herein may from time to time be translated into other languages or used in the course of written or verbal communications with existing and prospective customers, partners etc. In the course of such translation or communication some of the information contained herein may be lost, corrupted, or misrepresented. The accuracy of such alternative communications cannot be guaranteed. In the event of any conflicts or inconsistencies between such translations and communications and this official English language Info Memo, the provisions of this English language original document shall prevail. You acknowledge and agree that there are risks associated with purchasing, holding, and using NCCs in connection with the Company’s product, services and platform developed for such products and/or services (hereafter, the “Platform”), as disclosed and explained in the White Paper and in the Terms and Condition available at www.neurochaintech.io. If you have any questions regarding these risks, please contact us at contact@neurochaintech.io. WHEN PURCHASING NCC TOKENS, THE PURCHASERS EXPRESSLY ACKNOWLEDGED AND ASSUMED THESE RISKS. Only people who are fully aware of these risks participated in the ICO. Note also that the ICO excluded certain groups of people such as “U.S. Person” (within the meaning of “Regulation S” of the Securities Act 1933 under U.S. law). “Vesting” is used to describe the mechanism by which performance-based rights to tokens are earned. If an employee or founder leaves NeuroChain, they lose the right to any “unvested” tokens. These tokens are returned back to The NeuroChain Foundation’s treasury. “Lockup” means ownership has transferred to the person or entity but the tokens are locked and cannot be transferred until a predetermined date has passed or a stability of the token is ensured in the market. Lockups apply to both vested and unvested tokens. This is done both by smart contract and manual release for more flexibility according to the NeuroChain legal contracts. All lock up periods end on Q1 2019. The token sale agreement signed by purchasers provides that the purchase of the tokens and their subsequent use in connection with the services provided on the NeuroChain platform are governed by the Token Sale Terms Agreement, together with all applicable terms and policies published at https://www.neurochaintech.io. This Info Memo 4 is part of the Terms and Policies. The token sale contract also provides for a ‘restricted period’ and a ‘lock up period’. The restricted period goes until the delivery of the protocol. The lock up period says that NCC owners cannot sell their tokens before the end of the restricted period without NeuroChain’s formal written consent. This technically means that tokens purchasers cannot sell their NCC on the exchange before the V1 of the protocol is delivered, unless the green light is given beforehand by NeuroChain team. Our Info-Memo 1 provided that NCC would be delivered according to the following schedule: first release after the ICO, the second release 3months after and the third release at the mainnet. The following table gives the token distribution stat after the total release of the final lockup for the private sale purchasers and the team. As you certainly already know it now, the NeuroChain token, NCC, is listed by Huobi, Idax and Sistemkoin. 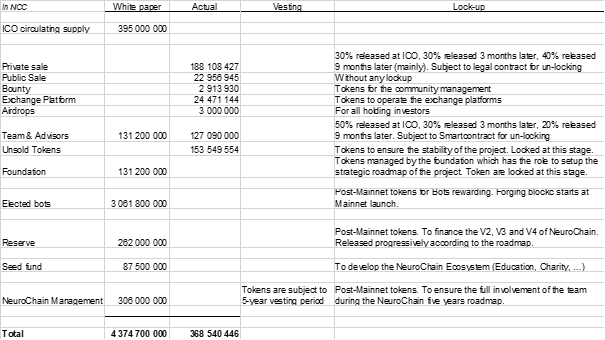 Various information about NeuroChain and NCC token are available, especially about the total market supply. According to the lockup of the private sale, the third released of tokens for the investors is 39,834,349 NCC. This third release is the last one before the token swap after the mainnet. Adding to that amount, there is 3% of the total ever supply going to the team. Due to the lockup, the third released to the team and advisors is 29,689,980 NCC. An additional 3% will be allocated to the foundation. The foundation and the unsold tokens are locked in deployed smart contracts, audited by Huobi and by an independent third party. The calculated circulating supply (distributed NCC) is 368,540,446 NCC. We are in contact with Coin Market Cap and CoinGecko to explain our method of calculation and validate this number. After concertation with the team, some private sale purchasers and some members of the community, and also with the exchanges, the NeuroChain team decided to release the third lockup of the private sale purchasers as expected. We took this decision because the team is convinced that the investors have all the necessary information about the NeuroChain project, it’s potential and the expected deliverables. Also, the process of NCC swap after the mainnet is simplified and this will avoid errors in the distribution during the swap. The release before the mainnet avoid trading problems in the exchanges during the process. The third release will initiate the process for the NCC swap during the mainnet release which is expected for Q1 2019.